At Coddan group, we offer a variety of prestigious company formation packages, giving you a choice of services from bespoke, tailor packages to a diverse range of numerous services. Our business is formed into individual groups allowing you to be directed to the service that best suits the needs of you and your business, giving you the luxury of efficiently setting up a company with the highest expertise in that division. 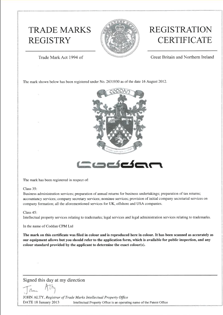 Coddan, is a well-respected and successful agent, which helps UK and non UK based customers to register a business. We are the companies formation service provider, and we have a team of friendly incorporation professionals ready to take your call and discuss all your needs. 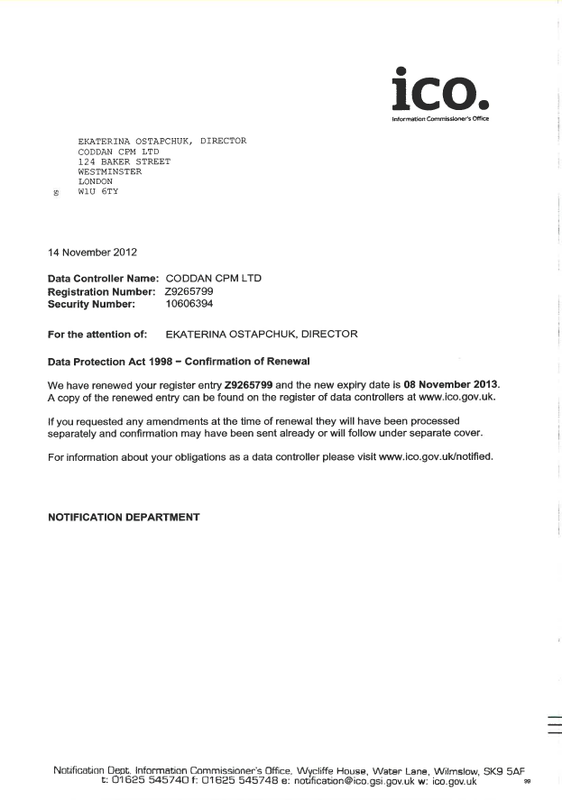 While Companies Houses provides detailed guidance relating to the registration process, Coddan is able to reduce the time and effort associated with registering a company. Using the latest technology, Coddan can create a new company within as little as six hours and can provide a registered address service to companies wishing to maintain separate registered office and trading addresses. 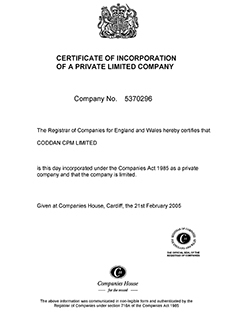 At Coddan, we have been managing the formation of UK companies for so long that we have the experience to streamline our processes to exactly match the business incorporation requirements of Companies House. This gives you not only a very rapid service but also allows us to offer you market leading low prices. Company start-up in UK is relatively straightforward; however, it is good practise to hire a company formation agent to take care of the legal red tape that goes along with the process of registering a company. A good incorporation agent will work with you to ensure that your needs are fully met, while also saving you the difficult business of negotiating government bureaucracy. This is especially crucial if you are a non-resident of UK. Non-residents do not have the luxury of owning a registering address for their business, and thus would struggle to get their company registered under UK's laws. A good company formation agent will provide not only a registering office address for you, but will be a registered and legally recognised agent who will be empowered to act on your behalf. This will entail designating nominee shareholders, a nominee secretary and a nominee board of directors. The company formation agent will help to register you fully and then also handle the day to say maintenance necessary to run a company in the UK. This will then leave you stress-free, knowing you are in good hands. For more than 19 years, Coddan has worked to provide our customers with only the best we have to offer: this includes the most competitive prices, the highest quality service, and the convenience that is deserved. Our overall mission is to provide entrepreneurs with what they want and to empower them with the ability to achieve their objectives and goals, both short-term and long-term. 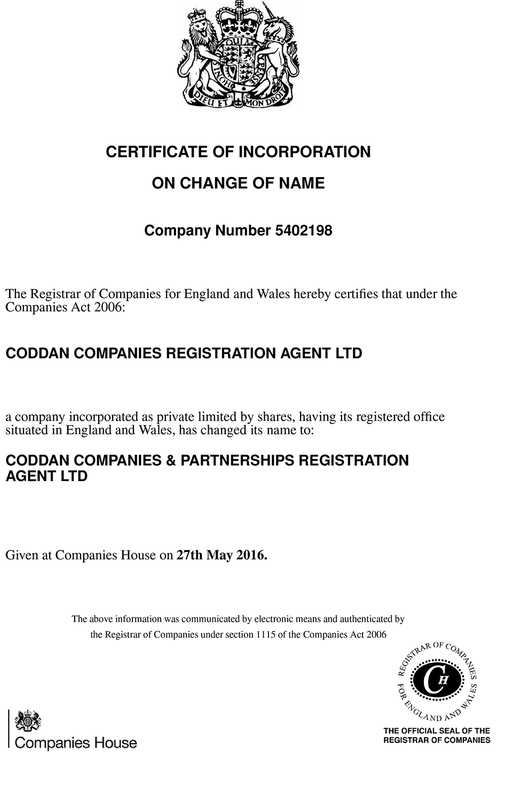 Since 1993, Coddan has grown to become one of the leading incorporation agents in the private and public companies formation industry. Why trust or choose us? Are you unsure of which type of business structure you should choose for your small business? You might be putting off making a decision because you are unsure of what is best for your business and how to go about doing anything to change the status of your business (such as by making it into a limited company).It can be difficult to sort through all of the information about the different options available and select the one that is right for your business and income. Ultimately, you will want to save as much tax as possible whilst maintaining flexibility to use your business income as you see fit to ensure that your business will thrive. There are several steps that must be taken to register a limited company and several more steps that must be taken on an annual basis to keep within the law and avoid penalties. 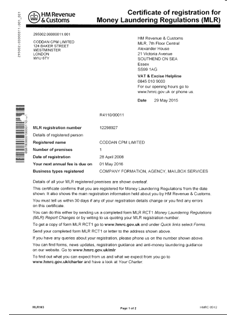 It is very helpful to get good quality advice from the reputable company formation agent about what registering your business could mean, and to get professional help in applying to Companies House to register your limited company or limited liability partnership. Coddan being business registration agent can give you all the information you need about your options and help you to make the right choice for your business registration. We can give you all the pros and cons that surround the issues of tax, income and liability and then help you to evaluate whether incorporation would be in your best interests. We can also help with issues surrounding the Business Names Act including advising on any additional forms that may need to be completed. For example, if you wanted to use the word 'British ' or 'International' or any other descriptive word in your business's name you might need to prove that you are entitled to do so without being (unintentionally) misleading. If becoming limited is something that you then want to proceed with, we as the company formations agent will complete all the necessary paperwork and register your limited company or form a limited liability partnership within one hour at Companies House online. We have already helped to set up over 200,000 companies over the last eight years, with between 20 and 40 new companies formed every day. If you wish to go ahead, we will register your limited company or limited liability partnership using your registered office address, and we will arrange for your chosen candidates to be made into director(s), secretary (if needed), and shareholder(s). 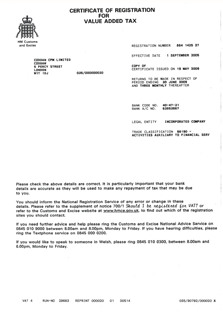 You will not need to fill in any forms or send anything to Companies House yourself. 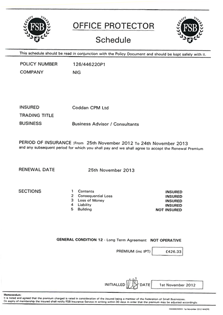 The prices of our packages include everything you will need, including the Companies House fee. We can also draft your memorandum and articles of association. We do not use the standard model as would be used in your own online application. We use our own drafted memorandum and articles of association, which have been approved by independent solicitors and by Companies House. We strongly believe that the standard model of the memorandum and articles of association are not good enough and do not cover enough details, especially for our customers whose businesses are based abroad or for our UK-based clients who are planning to do business in foreign countries. Since those clients are typically, the ones most likely to benefit from incorporation we have made sure that our model memorandum and articles of association are appropriate for all our clients' needs. If you instruct us to prepare the necessary registration forms, we ensure that there are no errors that could cause costly delay in registering your business. Alternatively, you could complete the online forms and one of our business consultants would then check it for any errors (that might be rejected by Companies House) or inconsistencies (that might cause problems for your business at a later stage). The forms are then submitted with the fee to Companies House and your business is registered as a limited company or a partnership. Currently, we not only support clients in forming new limited companies in the United Kingdom, but also in offshore locations, and the United States of America. 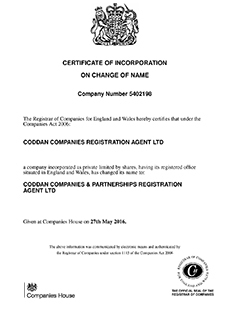 Coddan's limited companies registration agent' strengths and successes have come from our ability to remain flexible in a world that is extremely dynamic & constantly changing. Furthermore, our office based in London at Baker Street, in the building which belongs to us & our web-based business and method of receiving orders has provided customers with the most cost effective incorporation and rapid business creation service that can be expected. Although we mostly provide online supervision, Coddan also understands that it is crucial to maintain personal interaction with our UK & international clients, which is why we encourage you to send e-mails, access LiveChat, or simply pick up the phone. All advisors are available from Monday to Friday, from 9:30 till 18:00. To put it in basic terms, Coddan is an experienced companies incorporation provider & a new companies registration agent of new business establishments for our clients. Once you have decided to take the step to register your own private company, simply inform us of your specific desires so that we can refer you to a consultant who can best advice you. Even if you are only thinking of starting your small business, and need additional support, we can offer various "add-ons", such as nominee directors, nominee shareholder, members and nominee secretaries, or virtual offices in a wide selection of countries. 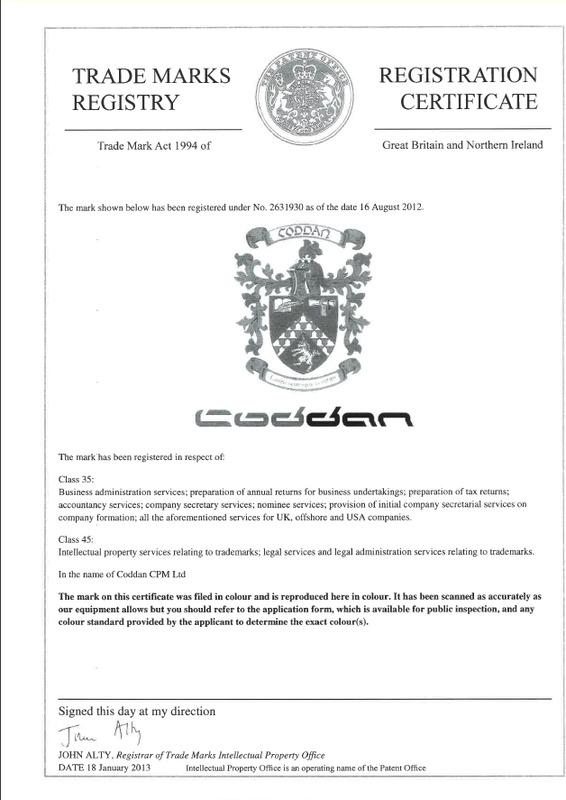 Over the years, Coddan has found that the provision of online incorporation services has proven to be the most effective method of receiving our customers' comments, demands, and questions. This is why our website caters to forming limited companies and offering various services via specially designed order forms. You can feel confident in knowing that all company-related activities completed on your behalf follow legal and statutory requirements within the relevant country where your company is intended to be established. As always we invite you to send us an e-mail or to access the LiveChat if there are any urgent questions or suggestions you may have. 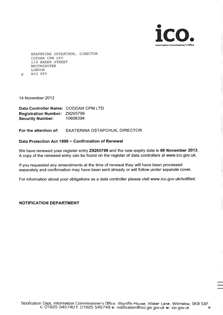 On Companies House web page you can find information about our company and the direct link to our website. Our secure system has aided many bookkeepers, accountants, lawyers and solicitors’ clients as well as direct to the public customers, throughout the UK and other countries. 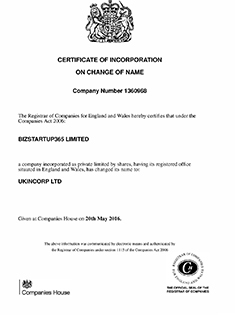 Our incorporation system makes setting-up a new limited company a very simple and straightforward procedure. It automatically produces and customises all the required paperwork, including: the memorandum and articles of association, the first meeting of the board of directors, the company's register and shares certificates. You may use our electronic filing program to register the different types of business entities in England, Wales, Scotland and Northern Ireland. We can register a new business entity in other countries, such as Isle of Man, Jersey, Guernsey, Republic of Cyprus, Alderney, and many other tax-haven countries as well. We will incorporate your limited company from scratch using your own registered office address, and appoint your own candidates to the roles of director, secretary (if needed), and the shareholder. That means that you do not need to complete and send any additional forms to Companies House or to complete the changes of the directorship and shareholder forms with the Registrar of Companies. In addition, you do not need to complete and send a cheque to Companies Registrar to pay a fee for your company incorporation; because the government fee for incorporation is included in the price of our packages. We do not use the standard published model of the memorandum and articles of association. We are using our own drafted memorandum and articles of association, which have been approved by the independent solicitors and by Companies House. Based on our practice, the standard published model of the memorandum and articles of association are not good enough and not nor complete enough for our foreign-based customers, or for the UK based clients who are planning to do business in foreign countries. Once you have completed and sent your online incorporation form to us it will be checked for errors by one of our business consultants, before being submitted to Companies House. Our business consultant will look for errors, omissions and inconsistency. They will contact you to review the form you submitted and they will answer any questions you may have. After the formation of your company we will only contact you if you require our assistance with any formalities related to establishing and the running of your business. 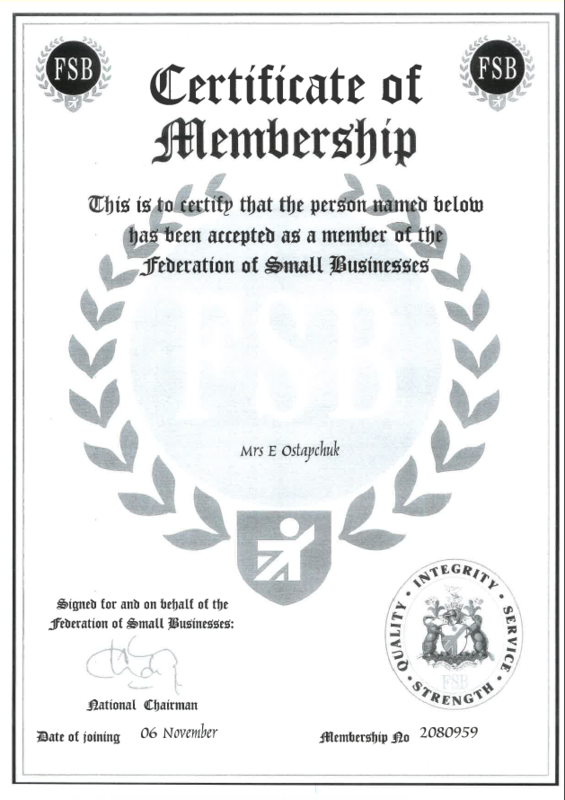 It is important to mention that, as we were registered within accordance of the Data Protection Act (our registration number is: PZ9265799), we do not share information about our customers to third parties. Since 2007 all professional service providers, who are offering companies formation, the provision of a registered office address, and/or a nominee officers services must be registered in accordance with the Anti-Money Laundering Regulations 2007. 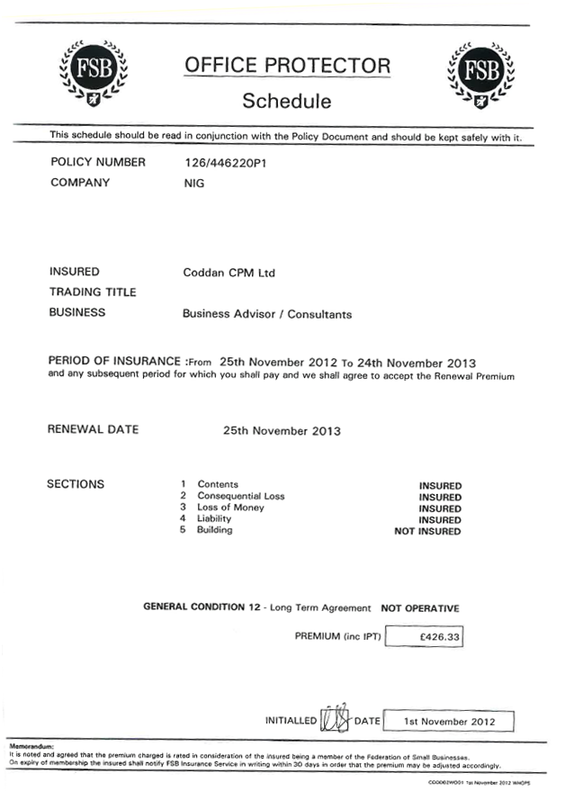 Coddan has been granted MLR registration number: 12298927. This means that we have passed the fit and proper test, successfully applied for and received the confirmation from HM Customs and Excise. 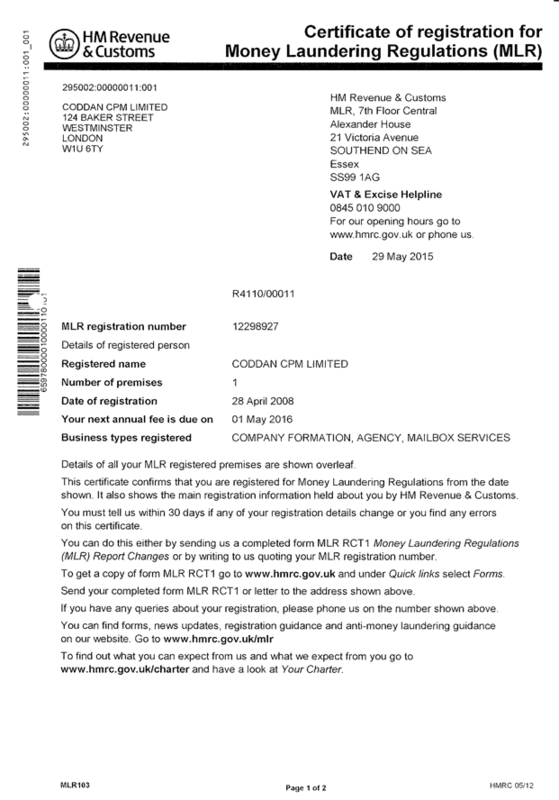 Please be aware that any formation agent operating without being the MLR registered is not complying with the requirements of the Law. We would strongly advise you to ask for an MLR number prior to processing a company formation through any agent. 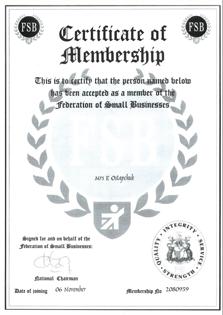 Coddan is the member of the Federation of Small Businesses. We also took a part in the business start-up overseas conferences organised by the UK business start-up community in May 2009-2010. 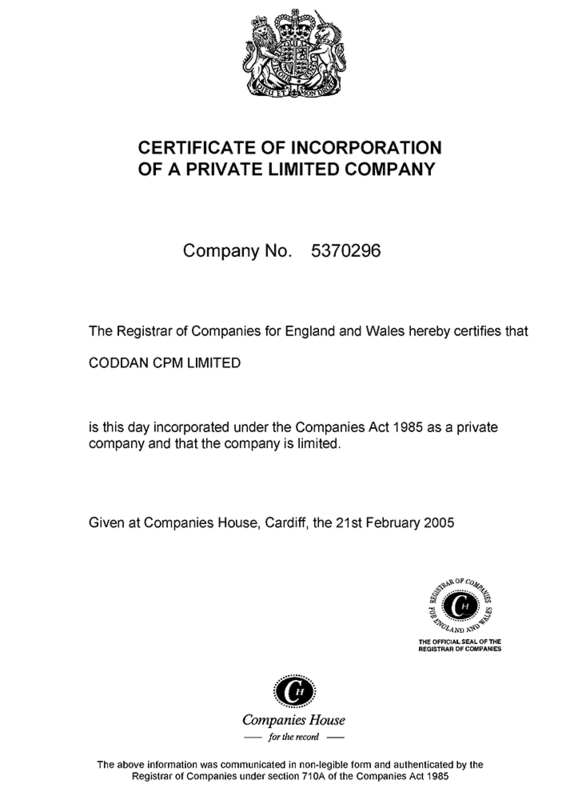 Coddan organises business seminars and training courses about the authoritative guide for directors and secretaries; the essential guide to UK VAT and international trade; the essential guide to international financial reporting standards and the employment law - a survival guide for employers, etc. We organise seminars and events at our own office premise located at Baker Street in London. We also offer special meetings and seminars for our overseas customers who are looking to establish, start and own their business registered in the United Kingdom. Coddan offers assistance with the opening of corporate banking accounts within and outside (offshore) of the UK. We do not use any sort of personal "links", we have a dully-signed agreement with the HSBC, Lloyds, RBS, Barclays, NatWest and other banks, we also have agreement with the some other banks based in the UK, Cyprus & other countries. Coddan is at the heart of a business environment in the United Kingdom, our main office is located at 120 Baker Street, London. Please call or e-mail us to arrange a private appointment at our office. We aim to provide you with the quality service throughout the life of your company and even beyond. If you are dissatisfied with the quality of service that you have received in any way, then please do let us know. We strive very hard to meet and exceed the expectations of our clients and we welcome the feedback; which in turn helps us to improve the quality of service to you and all of our clients. You may request and complete a client care report at any time. You can complete this anonymously if you would prefer. The client care report will be sent to the client care team who will review any information provided in that document and reply, if a name and address is supplied on the form. You may e-mail us with your comments/complaints. You can e-mail the client care team at clientcare@coddan.co.uk anonymously if you would prefer. You may write to us with your comments/complaint. Again, you can write anonymously if you would prefer. 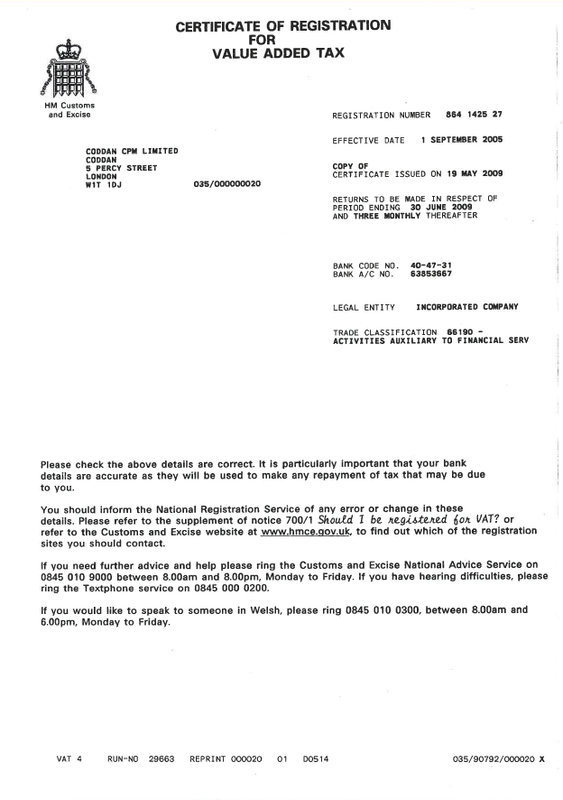 Any complaints that you raise, whether they are in relation to the service generally received, or in relation to a specific fee-earner, or any other matter, will be dealt with by the client care team and formally responded to if a name and address is supplied at the date of the letter being written. Firstly, try to explain your concerns to the fee-earner who is responsible for your case. If you feel that you have spoken to the fee-earner with conduct of your case, but you are not satisfied with the outcome of those discussions; then you can formally request that the fee-earner completes a client care report, which will be sent to the client care team. Alternatively, you can ask the fee-earner to provide you with a client care report, which you can complete yourself and then send to the client care team. If you are unable to resolve the complaint with the fee-earner then you can raise this matter with the client care team, which, from time to time comprises a director of Coddan (not the head of the client care), a solicitor and a support staff member. They will dispassionately and in an unbiased way, look at your complaint and they will respond to you formally, by letter, telephone, or both. If you are unable to resolve the complaint with the client care team then you can raise this matter with the director at Coddan who is the head of the client care. He will review all the information that has been prepared in relation to your complaint and will be willing to meet you to discuss the complaint that you have. He will then attempt to resolve the difficulties that you have faced. If you are still unable to resolve the matters internally then you have the right to refer this matter to the consumer complaints service, whose address is 120 Baker Street, London, W1U 6TU. The possible interception of the "e-mail" en route to its destination and unauthorised reading by a third party. The unintentional passing on of a computer virus. The firm has a full viral protection software package, but cannot guarantee that it may not innocently "contract" and pass on such a virus. If you wish to communicate with us by "e-mail" we will do this, but this will be without any liability on our part for either of the above risk occurring, including any claim that may arise from such communication on your request with third parties. Please note that you may terminate your instructions to us in writing at any time and we may, in extreme circumstances; wish to stop acting for you; for instance if we find a conflict of interest has arisen. If such a situation arises, we will give you as much notice as we can under the circumstances before we will stop acting for you. After completing all the work on your file, we will keep your file of papers (except for any which you have asked to be returned to you) for no more than six years. We keep the file on the understanding that we have the authority to destroy it 6 years after the date of the final bill we send to you. We will not destroy documents you ask us to deposit in safe custody. In the first instance you should contact the person dealing with your case. This is usually the person named in the initial letter we sent to you at the start of your matter. You can do this either by telephone, in writing or by an e-mail. Your complaint will be acknowledged upon receipt. In most cases, the person dealing with your matter will be able to resolve your concerns immediately. If this is not possible, we aim to provide a full response within ten business days. If the matter is complex, you may have to wait a little longer but we will always write to you within ten business days to provide a full update on progress and give you an estimate as to when we can provide a full response. If you are not happy with the reply provided by the person, dealing with your case you can refer the matter to his/her supervising partner or manager. The supervising partner or manager will consider your complaint and carry out an investigation and will provide a proposed solution within ten business days. If the matter is complex and it takes longer to deal with your complaint, we will contact you within ten business days to give you an approximate timescale of when you can expect a response. If we believe it would be helpful, we may suggest a meeting. Establish a New Business EntityThe temptation for people to start a business for themselves is overwhelming, especially considering the current economic climate. With such a vast scope of possibility to succeed and with the added incentive of being able to work as the boss rather than for the boss, the wealth of potential is enormous. The UK has very few restrictions regarding the legal requirements of starting a company, allowing people of all backgrounds to incorporate their own companies. The reality of establishing a new company is often harsh and cruel. While many small businesses thrive and are able to enjoy the financial benefits of their success, a great many fail. The cause of a business failure can usually be identified quite easily; perhaps the location was wrong for the intended product or service, or maybe the competition was simply too fierce. Having a clear business plan well in advance before incorporating your company is always beneficial and can help eradicate some of these problems early on. On this website, you will find useful and practical information that will help strengthen your business and enable it to grow. Whether you have a business or propose to start one, Coddan can assist you with all your business queries and needs. We offer professional advice and expert services to all our clients, and as an additional service, you can book a one-on-one consultation with a qualified advisor. Send us an email at info@coddan.co.uk if you have any questions or would like to learn more about our consultation service. All calls and emails are confidential. If you have an idea for a business and would like to start up your own company we can provide you with a fast and effective online service, usually registering your company on the same day. However, be advised that there are numerous issues that you should consider. For example, there are a vast array of business structures for you to choose from, all with different advantages and disadvantages. If you find the tax differences and legal technicalities confusing, you would definitely benefit from a one-on-one consultation where we can directly talk you through all the different areas. Personal consultations are extremely useful as our advisors can discuss matters of tax and offer advice on the most efficient way to structure your business. If you have any specific problems that need solving or are at a loss of which direction your company should go in, we can help you solve these problems with our extensive knowledge of the business industry. For a business consultation, you will pay an hourly rate of £125.00 (this price may vary depending on the particulars of the consultation). The consultations usually do not take longer than an hour though we can extend the time if we have to. After you have requested a consultation, we will allocate a time and a date and respond to you by phone or email. We will also ask in advance that you provide us with a list of questions you would like to ask in order for us to be fully prepared when you arrive. Our advisors can help you with all areas of business and any other questions you may have - big or small. Nothing is too complicated or too trivial. If you need advice on any other areas, please feel free to call us with your query and we will provide some assistance. Our advisors are available from Monday to Friday, 09.30-18.00.